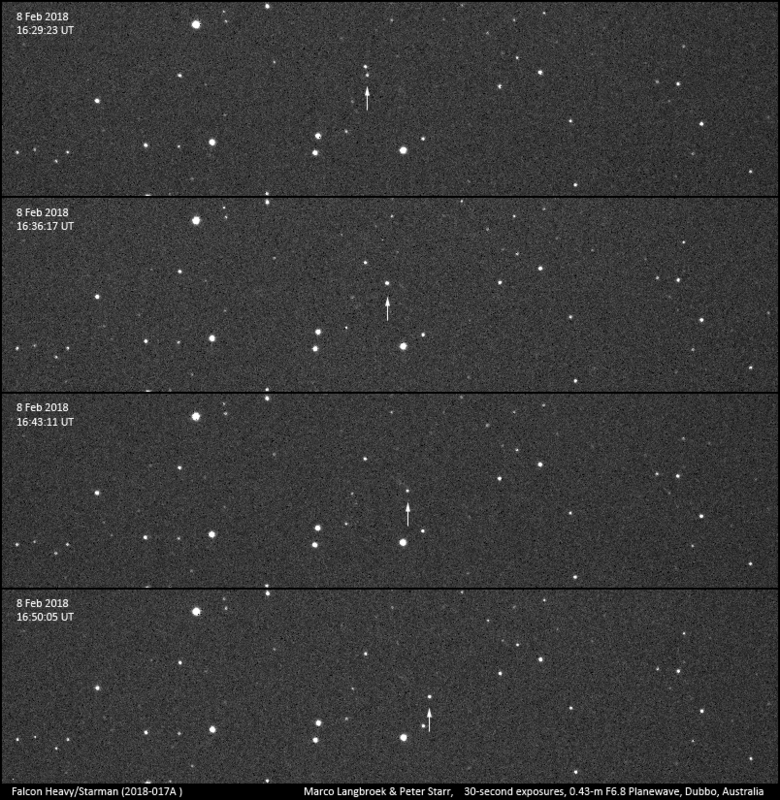 In the early morning of 27 February 2018, I was imaging a rocket stage from a classified launch, the NOSS 3-4 r/b, when suddenly a very fast, flashing object entered the FOV, and I followed it as it looked interesting (it was so fast that in the first instance I thought it was a meteor). It turned out to be the cubesat FLOCK 2E 4 (1998-067 JH, #41487). FLOCK 2E 4 is a cubesat that was released from Cygnus OA-6 in May 2016. It is currently in a 247 x 260 km, 51.6 degree inclined orbit, and from the imagery it is clearly tumbling. It is coming down fast, with several km/day, as it is close to decay. An analysis with SatAna and SatEvo predicts that it will re-enter in about a week, on or near 2018 March 6-7. 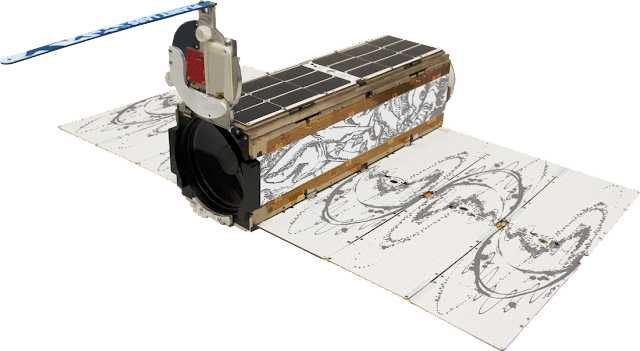 FLOCK 2E 4 was built by Planet Labs and was one of the imagers in their FLOCK constellation. It basically is a small 9 cm telescope with a camera, and delivered imagery of the Earth's surface with a resolution of a few meters. It is a very small object, the smallest I have managed to image in Earth Orbit so far. The body measures only 34 x 10 x 10 cm, and with solar panels deployed, the maximum dimension is 34 x 30 cm. A lucky capture! The camera used was the WATEC 902H with a Canon FD 1.8/50mm lens. I recently, as part of learning myself to code .NET Windows programs in Visual Basic, have started to create small, user-friendly (I hope) programs to aid satellite observers. TLExtract is a new program I have just released. 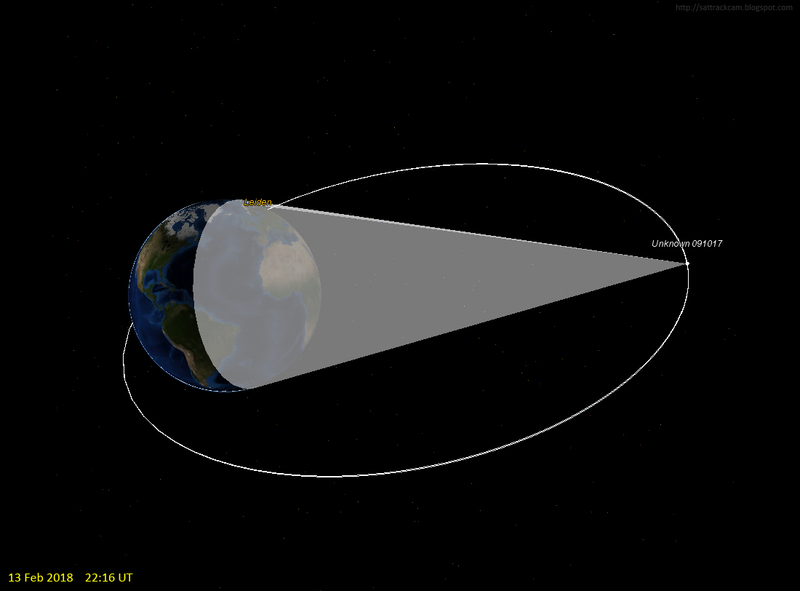 TLExtract is a program to select TLE's (satellite orbital elements) from a larger file with TLE's (for example classfd.tle or the full JSpOC TLE file), based on a custom-set condition. The resulting selection can be saved to a new TLE file. 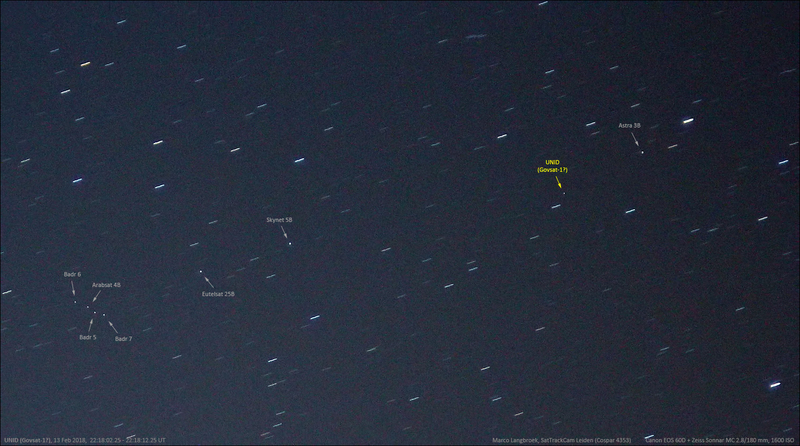 For example, you can use it to select all objects with perigee below 2000 km from the original file. Or to select or exclude all objects containing "DEB" or "COSMOS" in the name. 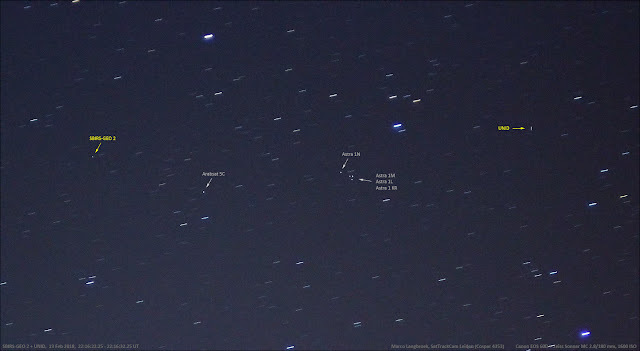 Or all objects with an orbital inclination larger than 45 degrees. Or all objects with a period near 1.0 rev/day (GEO). Etcetera. Element-sets in the input file need to be 3-line elements, i.e. they need to have the line 0 with the object name. The program runs under .NET in Windows. 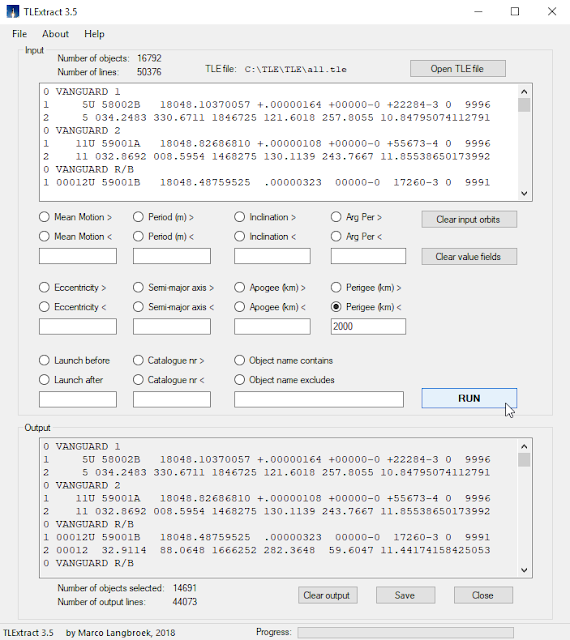 It accepts only one selection criterion per run, but when you want a selection to satisfy multiple criteria, you simply run another session on the output of the first session. The program can be downloaded at my website, where you can also find other programs useful to satellite orbservers, such as IOD Entry and TLEfromProxy, as well as some general astronomical programs - for example a program to calculate Solar Longitudes, and a program to calculate the Local Sidereal Time. UPDATE: version 3.0 features another improvement in speed, and solved a problem with hidden line carriers in the output, that messed up some software when the output file was read into them. I thank Jim King for his suggestions that led to these improvements. UPDATE 2: by popular request, version 3.5 includes an option to select on catalogue number. 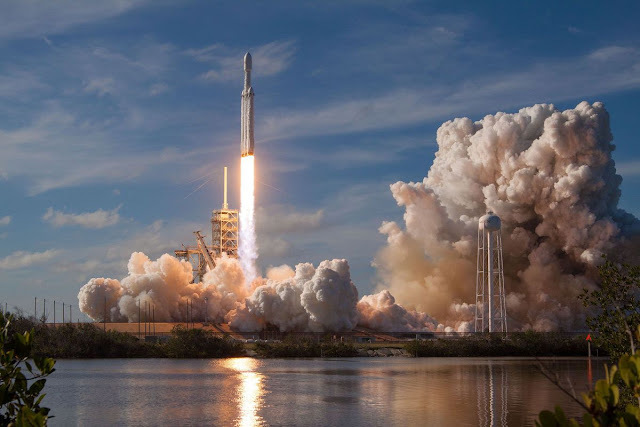 The image series above shows the Falcon Heavy upper stage 2018-017A, with the Tesla Roadster of Elon Musk and STARMAN attached to it, coasting through interplanetary space towards the orbit of Mars. 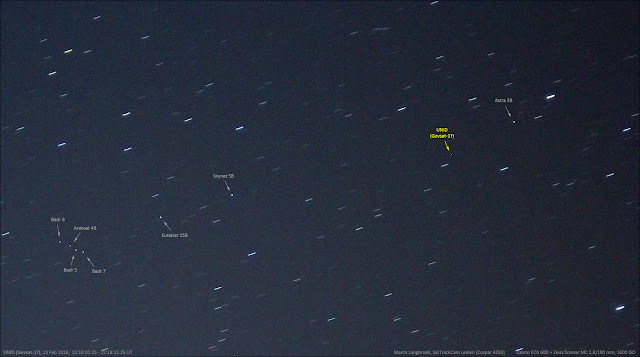 The @SpaceX #FalconHeavy / #Starman /#Tesla Roadster imaged yesterday 8 Feb 2018, 16:29-16:50 GMT, by Peter Starr and me using the 0.43-m telescope of Dubbo Obs., Australia. 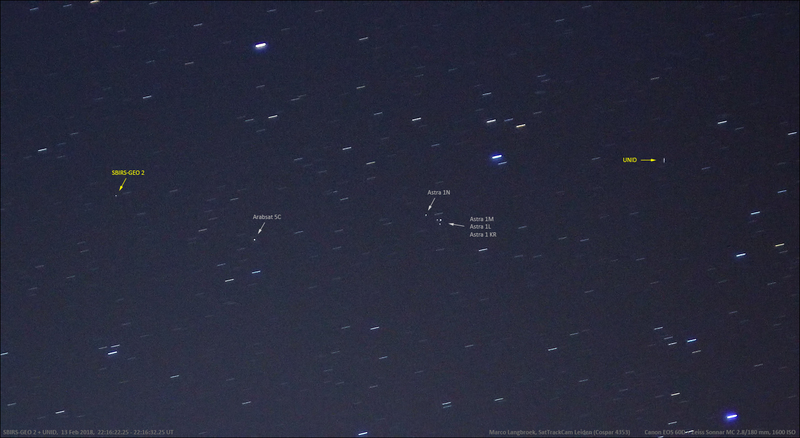 From four 30s exposure CCD images. 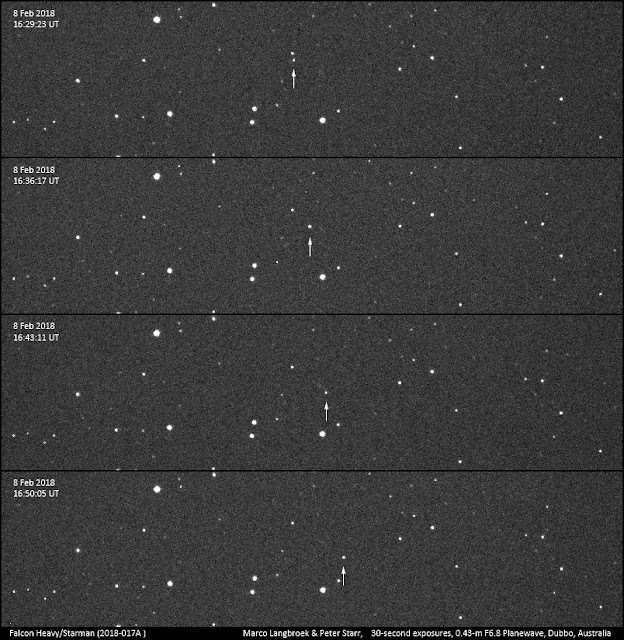 These 4 images are part of a lerger seies of images taken from Dubbo and from Q65 Warrumbungle, and they show a clear, slow brightness variation of +- 2 magnitudes between ~+14.6 and +16.6, with a period of perhaps approximately 4m 42s (the dataseries is not very detailed, so the real periodicty might be off from this estimate). While I did image objects in trans-Lunar orbit before, this is the first time I imaged something on an outbound true interplanetary trajectory. The trajectory and ephemerids are available on JPL HORIZONS. 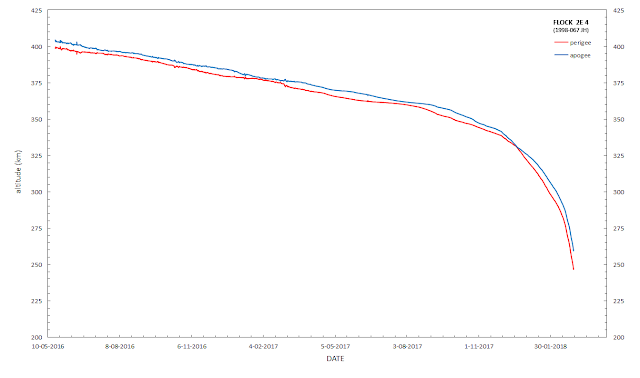 An early orbit integration I made yesterday before orbit updates from telescopic observations became available, suggests 2018-017A will be close to earth again in 2073. I did not have time yet to redo the integration now telescopic observations are improving the orbit, but will do so later. So stay tuned. UPDATE 2: I am quoted in this CNN article, which also features some of my imagery. This is the freakiest, most surrealistic image related to Space I have ever seen. 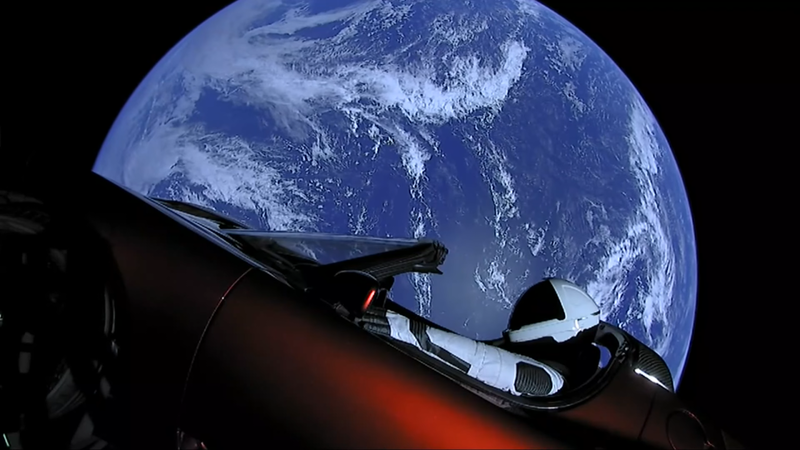 On February 6/7, as part of the Maiden Flight of the SpaceX Falcon Heavy, a Tesla Roadster with a dummy called Starman behind the wheel (and various other references to pop-culture tucked in the car) has been orbiting Earth in a 180 x 6950 km orbit for 6 hours, after which it was boosted into a heliocentric Apollo orbit with aphelion near the orbit of Mars. Yep, that's right: a car in space! That is something beyond my wildest dreams. 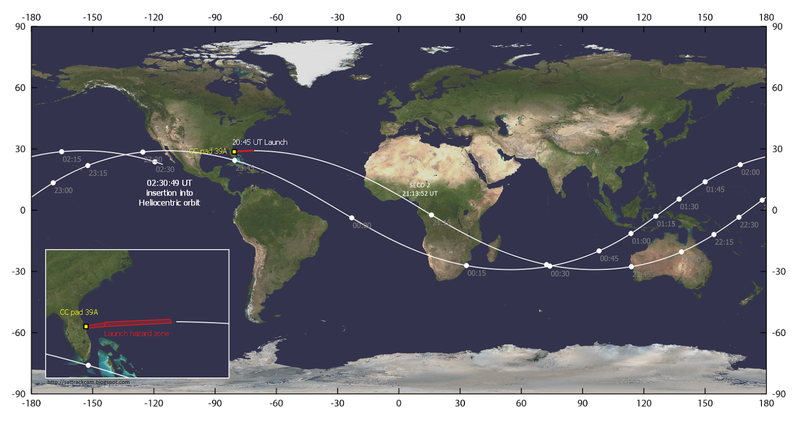 Above is the ground track of the slightly under 6 hours earth orbit. Launch was at 20:45 UT (6 February) from pad 39A at Cape Canaveral; SECO 2 was over Africa 28m 52s later, boosting it into a 180x 6950 km, 29 degree inclined elliptical coasting orbit. After just under two orbital revolutions, a third and final boost sent it into heliocentric orbit. The boost was widely observed from the US West Coast (see for example this hefty 256 Mb movie shot by Derek Breit in Morgan Hill, California). The heliocentric orbit is below. It has perihelion at 0.98 AU, aphelion at 1.67 AU and an orbital inclination of 1.05 degrees. The orbital period is 1.53 year. If this was an asteroid instead of a rocket stage and a car, we would call it an Apollo orbit. The aphelion distance of the orbit is similar to the aphelion of Mars, but located near the perihelion of Mars. The rocket stage and car will periodically come back to Earth's orbit. 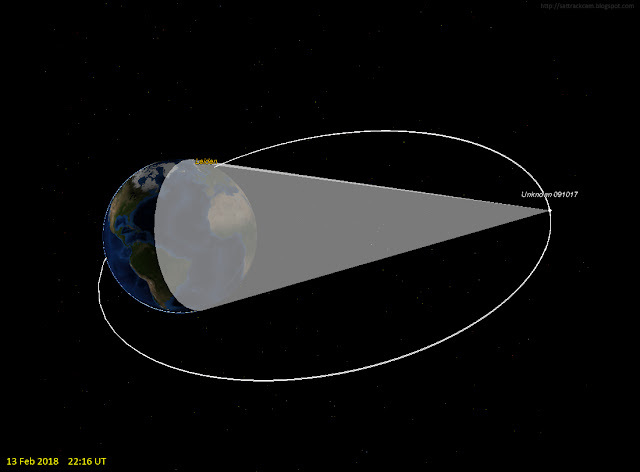 Near 27 January 2073, the rocket stage and car might make an actual close approach to Earth. My current orbit integration with MERCURY 6 has it passing at a nominal distance of ~0.004 AU or ~1.6 Lunar distances, and likely will be in reach of telescopes on Earth then. [EDIT 15 Feb 2018: after new orbit updates based on optical observations, the 2073 close approach is off the table]. The real distance might be more (or less) as the current orbit probably isn't very accurate (SpaceX earlier presented an orbit that was dead wrong) and the object(s), being of low area-to-mass ratio and shiny, moreover will be strongly influenced by Solar Radiation Pressure, which will perturb the orbit and is difficult to model over a 55 year timespan. 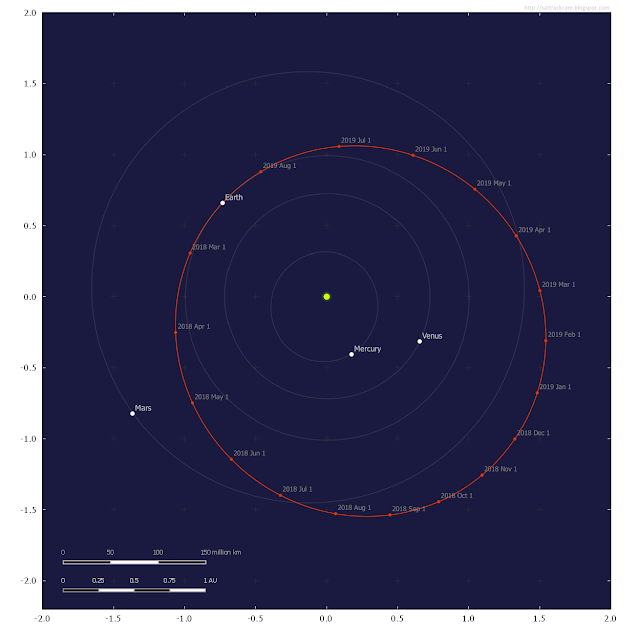 A less close approach (nominal values in the order of 9 Lunar distances) will happen in March 2137. Close approaches to Mars will not happen over the next three centuries. To me, this was the most exciting launch since I watched the first Shuttle launch on tv when I was a teenager. That big Falcon Heavy roaring into the sky was very impressive. 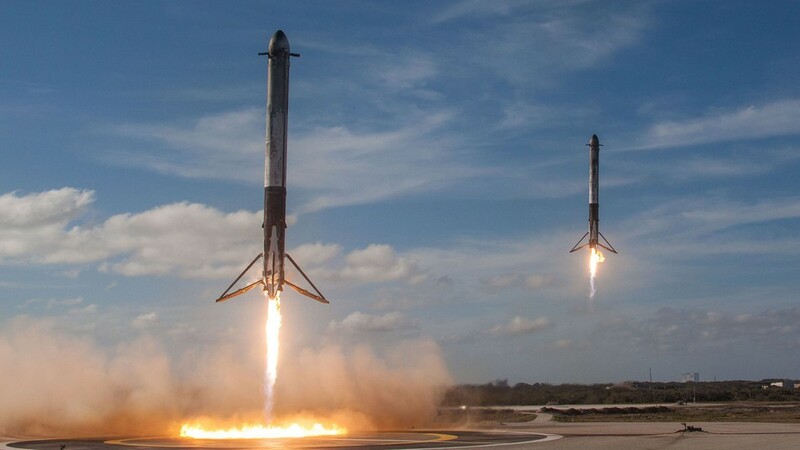 Even more impressive was the synchonous return of both side boosters, landing smoothly and brotherly next to each other. The core booster alas did not fare that well, and smashed to bits in sea. 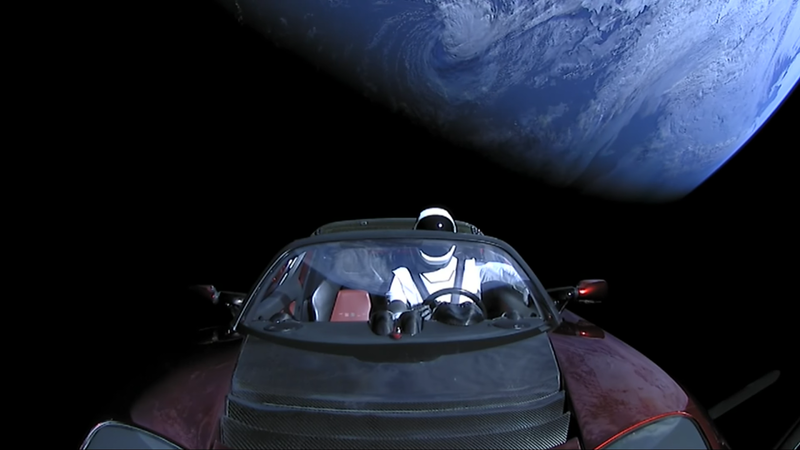 And then there were those surreal images of the Tesla orbiting earth, with "Starman" at the steering wheel. I reckon these will be iconic images for a very long time. The whole idea of launching a car into orbit is crazy of course, and it has drawn critique from some people. I do not share that critique. This is one of the daring, crazy, whimsical things that is so characteristic of humanity, and it fits iconic moments in exploration. The World needs people who are a bit crazy, in a good way. Otherwise it would remain dull and boring, with very little progress. Say what you want of Elon Musk, and of course this is primarily a publicity stunt (and brilliant marketing), but it appears Elon Musk is giving the human space program a real boost of the kind we haven't seen in a long time. After this stunt, I for the first time in my life get the feeling that I might really see humans walk on Mars in my lifetime. After all, if we can send a Tesla Roadster towards the orbit of Mars, we can send more. To my mind, this was absolutely awesome! UPDATE: see more in my follow-up post here with my telescopic imagery of the Falcon Heavy/Tesla Roadster in Space! And I am quotes (and some of my imagery features) in this article on the CNN website. The video footage above was shot by me on 25 July 2017 and shows the classified satellite USA 81 (1992-023A). 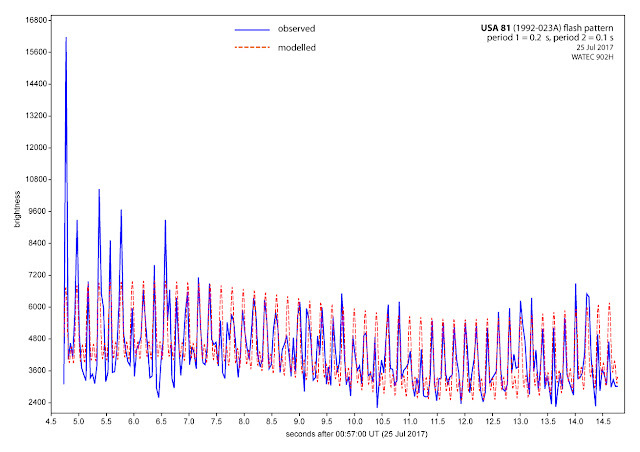 It is flashing rapidly, at ~5 flashes per second. USA 81 is one of two satellites (the other is USA 32; the attempted launch of a third one failed) on which little is known, but that were probably ELINT gathering satellites, probably in the Singleton/SBWASS program. It was launched from Vandenberg AFB on 25 April 1992 with a Titan 23G. With its earlier sistership USA 32, USA 81 is renowned for the light shows it puts on. It has a very rapid and at times very conspicuous flash cycle of sharp specular flashes, like a disco-ball: the video above shows an impressive example of this. How pronounced the flashing is depends on the viewing angle: the video above catches a brief period, halfway the footage, where it becomes very pronounced. The flashing is very regular and specular, with a main period of 0.2 seconds and a secondary period half of that, 0.1 seconds. The diagrams below show this periodicity well. They are the result of an analysis of (part of) the video above with LiMovie and PAST - the analyzed part of the video was the second part, after the camera repositioned, when flashing was most pronounced. 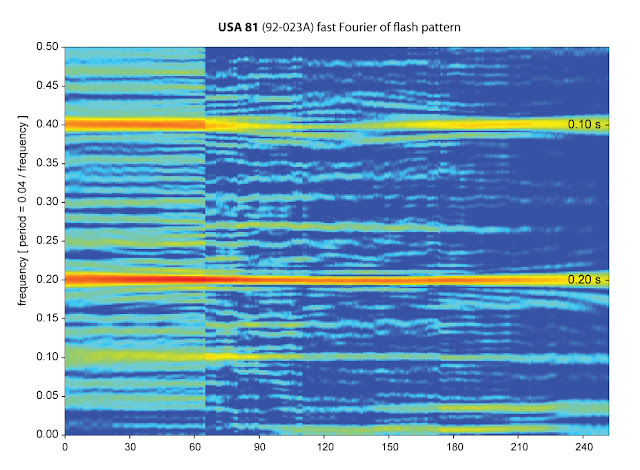 The earlier sister ship of USA 81, USA 32 (1988-078A), shows the same brightness behaviour (but with a main periodocity of 1.2 seconds) with the same periodicity. This points out that the flashing is intentional. There are two options to explain the flashing behaviour. One is that the satellite is spin-stabilized. The other is that the satellite could have a large and shiny rotating element, for example a large rotating antenna.